I arrived at Art Miami with my son Louis a few days before the fair. We needed to set up a complex installation which included a fully functioning hot tub. We had arranged a hot tub sponsor, but had heard nothing from them for over a week. Two days before the fair we drove to the hot tub retailer’s address and there was nothing there, just a concrete floor and some leaves! Louis got on the phone and managed to persuade a local company called Miami Pool, Spa, and Billiard, into lending us a tub for the duration of fair. It wasn’t quite the romantic wooden kind I was hoping for; more high tech with lights and music, but it was free of charge and designed to hold hot water. The tub arrived at th last minute and were filling it up with water well into the opening hours of the preview. A hot tub is highly interactive. The artist placed strange puppet sculptures around the edge of the tub as guardians. She sewed together beach balls in a lacy vintage style, and threw them into the water. Juliane had painted a series of swimming pool paintings, and we had pre sold two of them, which gave us sufficient confidence in the project as a whole. 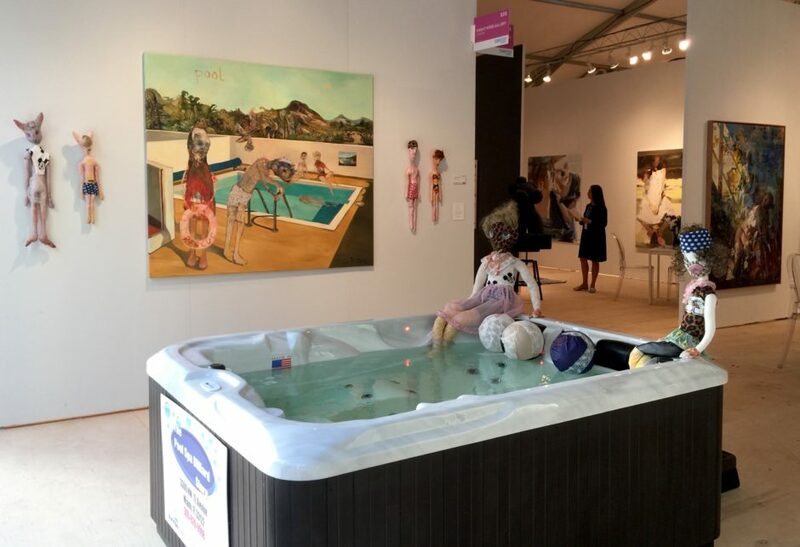 I guess Art Miami liked the tub, they still use it on their website.